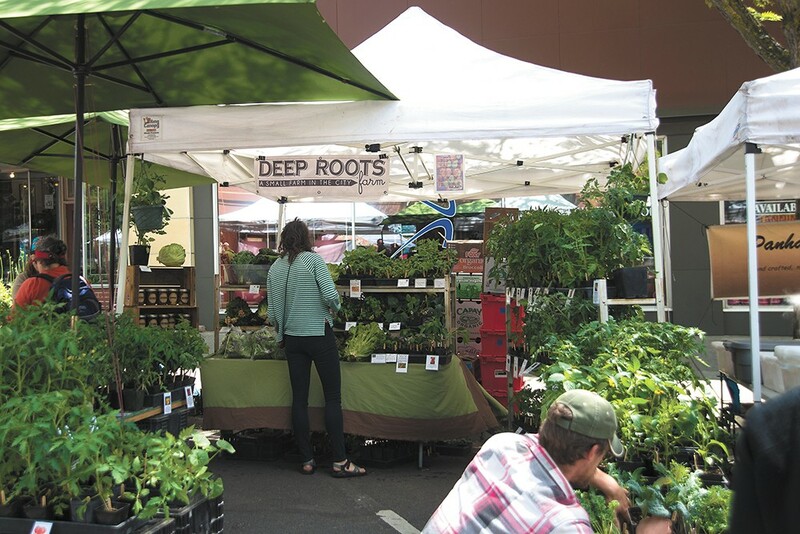 A shopper browses for vegetable starts from one of more than 100 weekly market vendors, Deep Roots Farm. For years, Brush Creek Creamery only sold its cheese at the Moscow Farmers Market. Rebeccah Salmeri, manager and co-owner of the Deary, Idaho, creamery, says that's where they've built relationships with customers and other vendors who have the same desire to build a small, home-based business that keeps them out of the "rat race." The creamery has done so well that last August, after eight years at the market, it opened a storefront in Deary. When Salmeri and her husband joined the business five years ago, Brush Creek was producing 35 gallons per week. Now it produces 600 gallons a week and ships to stores across the country. "We sure have experienced exponential growth," she says. Brush Creek isn't the only business that's been wildly successful as a vendor at the Moscow Farmers Market. According to an economic impact report commissioned by the city of Moscow and produced by an economist at the University of Idaho, the market pulls in millions of dollars each year across the 26 weeks it runs every Saturday between May and October. Annual market visitors grew 96 percent in one 10-year period, to nearly 164,900 from 2003 to 2013, and the market boasts an average annual growth rate of 7 percent. Published last September and compiled by U of I economics professor Steven Peterson and Moscow-based research economist Stephen Pool, the report underlines that after 40 years as a local institution, the market presents the quintessential image that Moscow and Latah County residents want the world to see: a vibrant business community that built a successful local food movement and encourages local art and culture. That much is evident to anyone who visits. On a Saturday morning in June, the market teems with people mingling with the approximately 126 vendors, shopping for the first vegetables of the season and waiting in line to buy lunch from one of the many prepared-food vendors, or just strolling the length of the market — on Main Street between Third and Sixth Streets — holding a cup of coffee from one of the nearby shops. A new report shows that shoppers at the weekly Moscow Farmers Market infuse millions of dollars into the local economy each year. Solo musicians play at either end of the market and live performances go on all day in Friendship Square, a small park at the market's center. Brunchers sit at restaurant patio tables on Main Street, dining leisurely and people-watching. It's an attractive picture of commerce. While city officials knew the market served as an economic engine — after all, it's been named the best market in all of Idaho — the report attached figures to it that blew some city officials away. "It's really a big deal," remarks Jen Pfiffner, Moscow assistant city supervisor. While vendors reported sales of about $1.2 million in 2015, the report estimates spending is much higher. Based on surveys over the years, it estimates that shoppers spend at least $4.2 million annually. 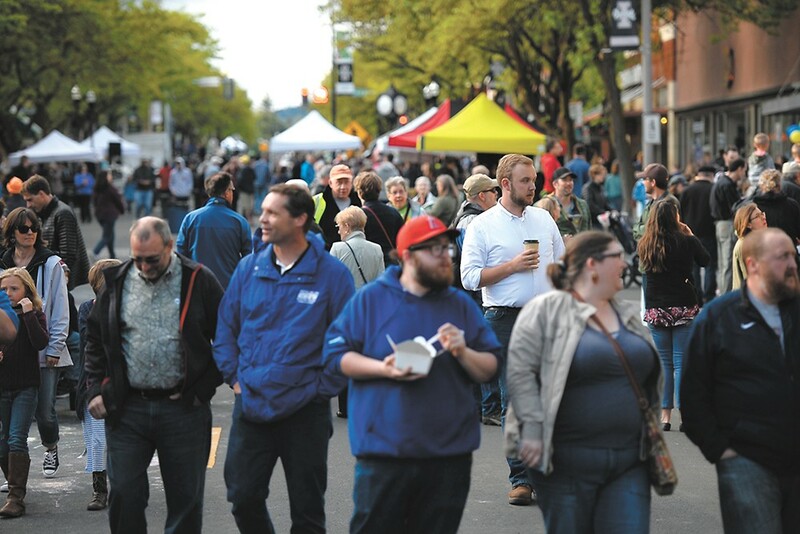 A 2013 survey reported that visitors spend at least $2.5 million inside the market, and another $1.6 million at other downtown businesses on market days. Combined with the market's power as a brand ambassador, the report demonstrates why the market is and will continue to be a good investment for the city "that's worth preserving," Pfiffner says. She is most impressed by the number of businesses the market has inspired. The report found that the market has helped launch 67 Latah County startups, from farms to restaurants to artistic businesses. It also estimates that between 25 to 30 market vendors have found enough business to grow and add a brick-and-mortar store, like Brush Creek. Patty's Mexican Kitchen, a restaurant and caterer, started as a booth at the market. As a graduate student at the U of I, Gerardo Alvarez began the business with a $50 investment in supplies in 2001. "The Saturday market in Moscow is a huge thing," says Walter Beckmann, a manager at Patty's. "That's why Patty's is a restaurant now. It's all because of the market. Patty's makes really good salsa — delicious salsa — and it just snowballed out from selling salsa at the market." For its part, Brush Creek continues to sell at the market in addition to its busy storefront and wholesale business. "I really enjoy doing the market," Salmeri says. The report has also been useful to the city when it comes to planning and budgeting. The Moscow Farmers Market was formerly administered by the city's arts department, but since grew into an enterprise that took over that division. Now, it's standing on its own with a full-time market manager. The Farmers Market Commission, established in 2013 and made up of three vendors, representatives from the Chamber of Commerce and University of Idaho, and four residents of the region, has also begun a strategic planning process to evaluate how to accommodate growth without losing the integrity of the small-town market in the picturesque Palouse valley.